We specialize in steel Wire Forming using spring wires in diverse shapes such as flat, round, square & rectangular. We use a variety of metals ranging from steel & copper, to annealed materials, bronze, & alloys, as per needs. Our trained wire forming specialists as well as the use of precision machines are capable of metal wire forming in varying dimensions depending on the material or the specific requests of customers. 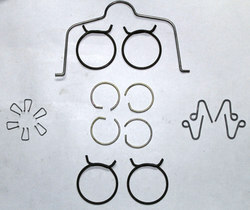 We are involved in the manufacture and supply of Wire Forms. The forms are available in variety of shapes and sizes and can be custom made as per the client’s specifications. These products are known for flexibility, durability and corrosion resistant features. 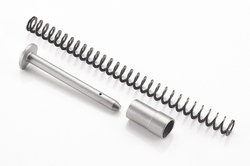 We specialize in producing Flat Wire Spring in diverse shapes such as flat, round, square & rectangular. They are made from superior-quality Stainless Steel and have a tight tolerance level. Moreover, we pack these springs using genuine quality packaging material, in compliance with the international quality standards. 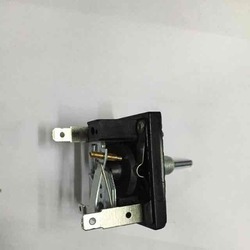 We bring forth for our patrons an elite assortment of Wire Forms for Regulating Switch. It is used in much industry for its design and features to make the production easier and efficiently. Our skilled professionals manufacture this assortment with the help of latest technology and skills. To keep the quality as per the set quality norms, our quality controllers work at fabrications. Further at the end the assortment is available at cost effective rates.